It's Friday, it's 10:30 and like usual, Wayne and Garth are presenting their TV show. First they start off by reading a top-10 list of the worst games they recently played at the arcade. Then Wayne accounts on how he and Garth were suddenly sucked into a video game, and Garth was kidnapped by the mysterious Zantar. "Weeuuu, weeuuu, weeuuu!" FLASHBACK, and now you're suddenly in control of Wayne as he must embark upon a quest to save his good pal Garth. 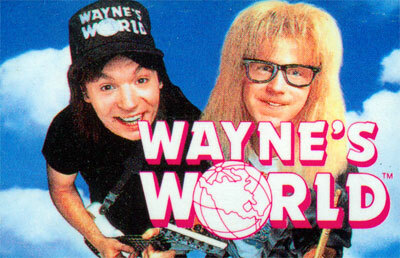 Not to be confused with the DOS license, this Wayne's World is a platform- style game. You must jump, fight and rock your way through 4 different levels which include Kramer's Music Store, Stan Mikita's Donut Store, Gas Works and Surburbia. Using Wayne's guitar as your sonic weapon, it's most excellent noise will bring death to various enemies. Will you save Garth from the evil purple clutches of Zantar? SCHWING!